Chemicals companies are becoming a hot item for private equity. The US chemicals sector is represented by 80-100 sub-sectors and has approximately $1tln in revenues. Of that, private equity firms control $64bn. Globally, chemicals account for $2.5tln in revenues. Private equity has had a varied role in this space in terms buying companies, and also securing discounts for strategic buyers which has supported consistent activity in chemicals M&A. As a group, chemicals companies have a lot to offer private equity firms. The industry is global, and much of the new activity grows with other sector spikes. The companies themselves also offer decent scale, relatively limited competition in their sub-sector, and high barriers to entry. Secondary chemical deals have also seen new momentum this year – a trend that is likely to continue into 2013. Big names like Riverside Co. have recently announced secondary deals like their sale of chemical maker DuBois Holding Co. to Aurora Capital Group. “Private equity, as it relates to the chemical industry, has been a consistent participant in M&A year after year,” explains Telly Zachariades, partner in The Valence Group, a boutique M&A advisory investment bank specializing in the chemical industry. Private equity investment in chemical industry M&A accounted for 8% of private equity transactions in 2012 alone. 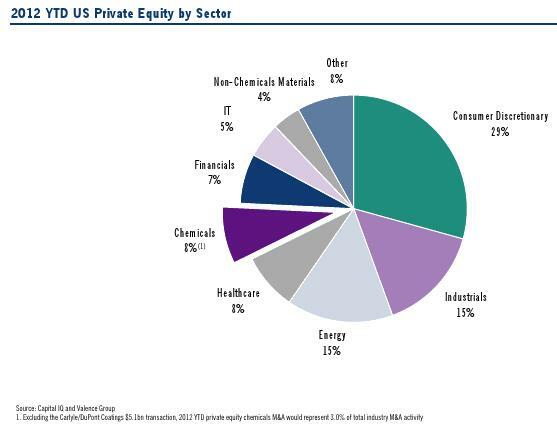 Since 2000, private equity has accounted for 17% of the chemicals industry total M&A Value, with 2007 marking the peak year at 20%. Historical data shows that relative to strategic buyers, chemicals transactions offer private equity a 7.2x multiple on average, making the space appealing for firms of all sizes. “The financing markets for good chemicals properties are in good shape and relatively cheap,” Zachariades says. Despite this, in order to invest, GPs have to come with greater technical understanding of the industry than they might otherwise. This makes for limited competition among firms but also stiffer competition overall. The role of private equity in the industry has also changed, Zachariades notes. Early on, private equity may have been more focused on fixing, IPOing, or selling the business, but now much of that has changed. “Private equity sometimes gets a bad rap, particularly in Europe, but that attitude is very old. There was a time long ago when private equity had a reputation as an asset stripper and cost cutter, but the attitude of private equity today is what can we do with this company to improve and grow it,” he says. Now private equity firms are more focused on growing their businesses rather than going to the IPO market. Some of that has to do with cost. According to Zachariades, companies need to be sizable, with an EBITDA north of $100m to justify an IPO. This reality means that companies and GPs alike are redefining what it means to add value, and grow in the space. Today, fixing broken businesses or consolidating niche areas are finding more favor. Geographies can also provide opportunity – Asia is a rapidly growing region for chemicals M&A, and is on pace to continue attracting firms as those economies grow. “One third of the M&A activity now is coming out of Asia, in about five years I expect it will be half,” Zachariades said.